I love that Mad Lady has such unique pieces I wouldn't be able to find at an ordinary mall! Love that Madlady have very unique clothing and I love the bathing suits! I really like the fact that they have very different, unique, and edgy style, their shorts and leggings are amazing! What i like the most is the spectrum of styles which we can choose between. They have such amazing accessories, that I could have every piece, every little thing from jewellery. Simply - it is fashion. oh god this shop is amazing! I like the fact, that they're from Europe, so I don't have to pay tax - important thing! I love the great selection of edgy shorts! What I love about Mad Lady is that they are original and I strongly believe that they have great pieces to bring out the best in their customers! The clothes are so edgy, so unique and I'm sure if you wear them you will feel nothing but wild and free! I love the galaxy leggings! Mad Lady sells clothes which are wild, but pretty and I think that's a great mixture :) Love the clothes ! Love that their clothes are edgy and follow street style trends a lot! I love the easy to wear pieces, and SUPER cute shorts and leggings! i love the earrings! shorts are badass and i so need that gorilla tank! I like Mad Lady's unique style! I love the leggings and accessories! I love the low prices! I love their cutoffs and shorts! The cutoffs with the crosses are my favorite! I love the outfits and pictures. Love Mad Lady's shorts.. ♥ Fierce..
i LOVE their shorts! you can probably find bleached, dyed and studded shorts anywhere on the internet these days, but holy crap mad lady's shorts are just so unique and awesome looking! totally worth buying haha. plus their galaxy leggings are just awesome!! Gorgeous! I want to have them too! The Mad Lady line is very unique and original! I love all of their tops! Mad Lady sells purses, ethnic tribal items and many unique clothing that I never find in other online shops, especially their accessories! oh, they sell bodychain too! I need some items from this store! I love how affordable their clothes are! I love their uniqueness- who want be different or want to outstand can easily do it with these fabulous tees, shorts and hilarious accessories! What I love about Mad Lady is their SOOO MAD COLLECTION OF JEWELRIES! I really really hope to win! I love the leggings sooo much!! Your galaxy prints are to die for, and I absolutely love the simple yet pretty design of the blog. I love your unique sense of style! Obsessed with the galaxy print leggings! I love these galaxy print leggings!! I love their line and especially their leggings. I like how they sell unique and eccentric clothing unlike a lot of brands that sell where I live. all the clothes are really cool! 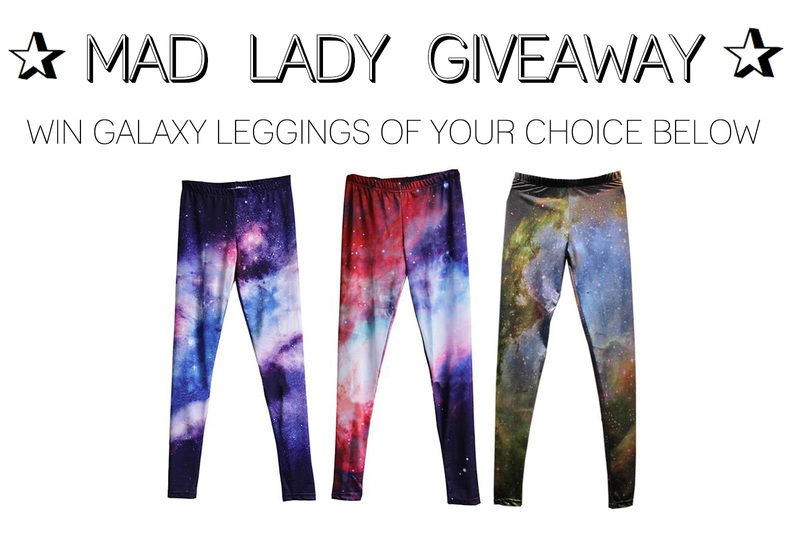 I keep seeing this giveaway on my bloglovin', and I decided I want a pair :> i love the red and purple ones too! how do we enter in the giveaway! I love how unique all the accessories are and the galaxy tights are of course to die for! Your style is absolutely amazing! I am a new blogger and I'd love to hear what advice you have! I've been blogging for about three months and I'm just dying to connect with other bloggers! It's on sale! The clothes they sell are in the latest trends! the shop is F-A-B-U-L-O-U-S.